Clear Spherical Form 1. 2005. My personal involvement in every part of the making process has enabled me to develop an individual style through which I am always striving to grow technically and artistically. 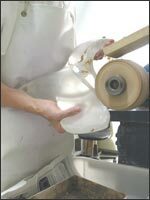 I have worked continuously as a designer maker since leaving Stourbridge College of Art in 1978. I spent two years as artist in residence at Royal Brierley Crystal making one-off pieces in glass and metal. 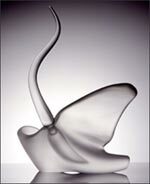 Then in 1980 I joined the Glasshouse in London where my style of thick clear blown glass, enhanced by the use of cold techniques began to evolve. By 1985 and the formation of Glass-Works(London)Ltd, my work encompassed repeatable functional pieces and deeply carved one-off forms with a purely abstract sculptural identity. 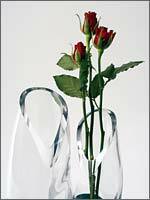 In 1997 I formed my own company, Catherine Hough Glass. 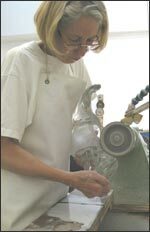 All my work is based on free blown forms using a mass of glass which is then transformed through the use of cold techniques such as carving, cutting and texturing with diamond and carborundum wheels, grinding and polishing, and sandblasting and brushing. My interest in these techniques arose from a desire to further develop the blown form, rather than for surface decoration as they had traditionally been used. Ideas and their development have evolved during my many years of practice, but there are some themes that have been fairly constant. Pebbles, geological strata, birds, fish and plants are a constant source of inspiration. My black lined pieces were based originally on the lines of quartz in pebbles. Other pieces on these themes include “Nucleus” a one-off pebble form now in the Fitzwilliam Museum Cambridge, ‘Dancing Bottle’ a winged form in the Crafts Council Collection, and a three part ‘pebble’ structure in the V & A Museum in London. Since 2003 I have concentrated on non-functional abstract forms that challenge my use of cold working techniques. An example of this is the re-thinking of the cut spherical perfume bottles that I first made at The Glasshouse, into a series of large hollow spherical forms radically carved to reveal their interior space. Through the varied positioning of these forms with no fixed base, or the use of multiple forms, I aimed to counterbalance the opposing characteristics of movement and stillness, weight and balance, line and space through the mass of the clear glass. My work continues to evolve with a new emphasis on the manipulation of images which are drawn from my interest in photography and the natural world. Through the use of these images on single or multiple, abstract or functional forms I am continuing the exploration of the interaction of form, line, and movement, transparency and reflection, that the unique qualities of glass endlessly facilitate. I enjoy the challenge of working with students through workshops, such as the Contemporary Glass Society workshops held at Dartington, and occasional days in colleges. I am particularly keen to communicate the wide range of possibilities of developing form through cold working techniques. Colleges I have taught at include: De Montfort University, Buckinghamshire Chilterns University College, Lancashire University, Edinburgh College of Art and The Royal College of Art. Design Work for Dartington Crystal. In recent years I have gradually phased out personally made repeat work and limited edition pieces in order to concentrate on the creation of one-off pieces. 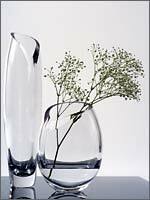 However, it has been a great pleasure to be able to continue that aspect of my work by producing designs for Dartington Crystal such as the ‘Curve’ range of vases.